Around 70% of menopausal women suffer from a combination of symptoms that range from mild to extremely severe. Menopausal symptoms typically last for the whole menopausal transition, until the mid-50s, but some women may experience them for the rest of their lives. The most common menopause symptoms are hot flashes, night sweats, irregular periods, loss of libido, and vaginal dryness. Nevertheless, there is an array of unusual symptoms that can bother women, too. This symptom causes a sensation similar to that of a hot drink burning the tongue. It's typically accompanied by burning pain at the tip or back of the tongue or other areas of the mouth. Like many other menopause symptoms, it has been known to last for several years. It's thought that hormonal imbalances cause this sensation, meaning sufferers of this symptom usually experience it directly before and during the menopausal transition, when hormone levels are constantly fluctuating. Another example of one of the more bizarre menopausal symptoms is electric shocks. During menopause, these can occur in the head or layers of tissue beneath the skin and may be followed by a hot flash. It's not fully understood why electric shocks occur, but the prevailing theories are vitamin B deficiencies or hormonal fluctuations affecting the cardiovascular system. Electric shock sensations are also a common symptom of medicine withdrawal (particularly antidepressants), due to the sudden absence of certain chemicals in the brain. Itchy skin is another of the rarer menopause symptoms experienced by some women. Itchy skin can be uncomfortable, and detrimental to health. Some women have trouble sleeping, while others scratch too much and damage their skin. Some women experience a feeling likened to ants crawling on the skin, but this only affects a small percentage of menopausal women. 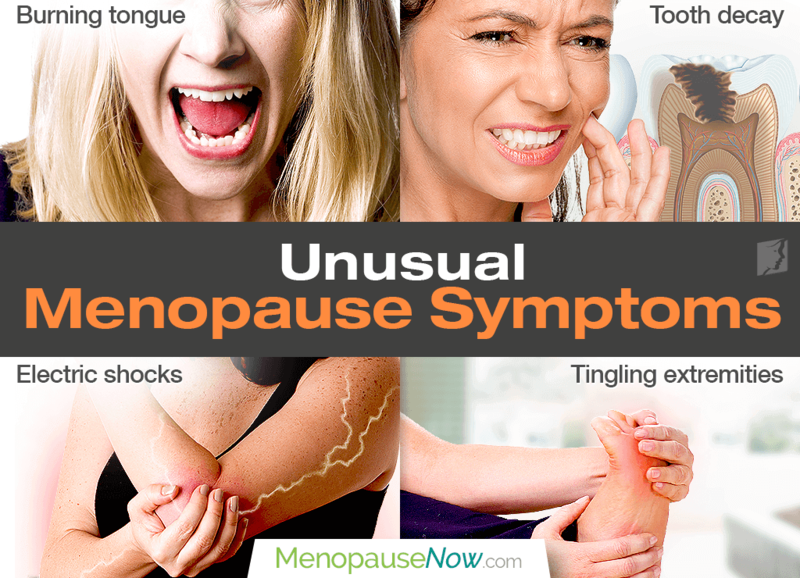 Menopause has a great many different symptoms associated with it, some rarer than others. Some other uncommon symptoms include tingling extremities, gum problems, and bloating. Regular exercise. Keeping your body stable and in good health can decrease the levels of hormone fluctuations, which are responsible for a number of symptoms. Healthy diet. This can also keep your body stable and reduce hormone fluctuations. Increase your fruit and vegetable intake, and eat more fiber and complex carbohydrates. Alternative medicines. Some women find that acupuncture or herbal teas can help them alleviate menopausal symptoms. If you ever feel that your symptoms are severe, or are greatly impacting your life, please consult a doctor. Are Peanuts Beneficial for Heart Health in Menopausal Women? Q&A: What Are the Emotional Symptoms of Menopause?